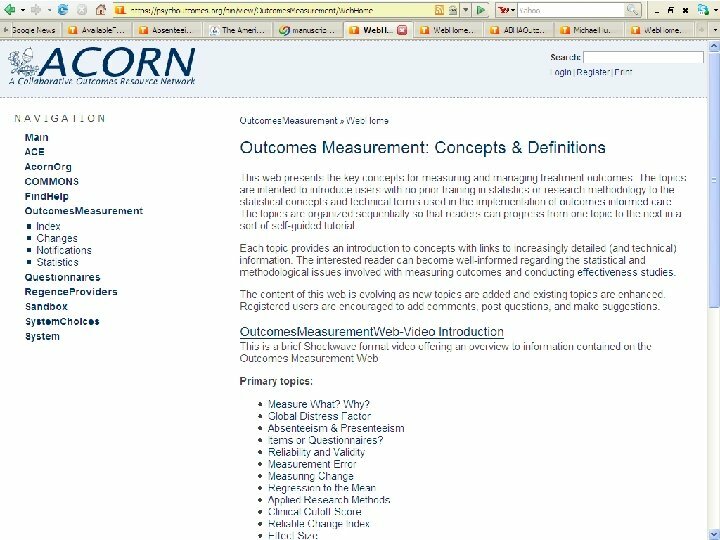 Why measure outcomes? • Decades of research have shown that psychotherapy is effective for a variety of conditions. • Likewise, decades of research have shown that medication is effective for a variety of conditions. • Sometimes, combination treatment has seemed to be even more effective. 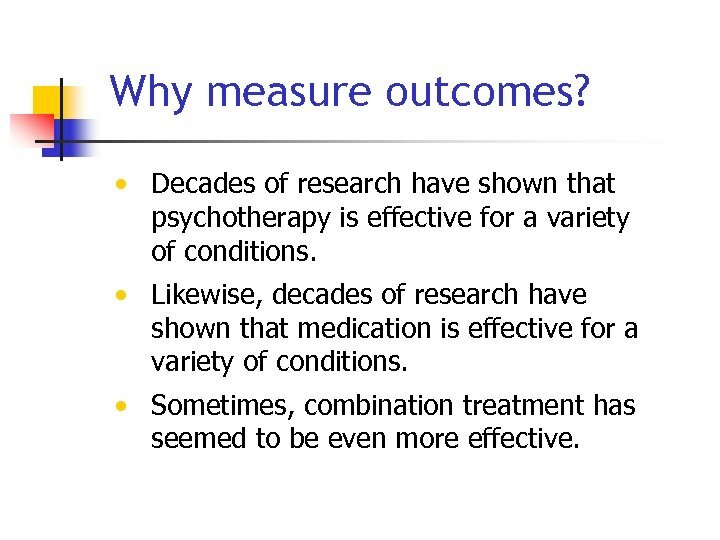 But… …There is great variability in outcomes from one patient to next, whether the treatment is • Psychotherapy • Medication • Combination treatment. 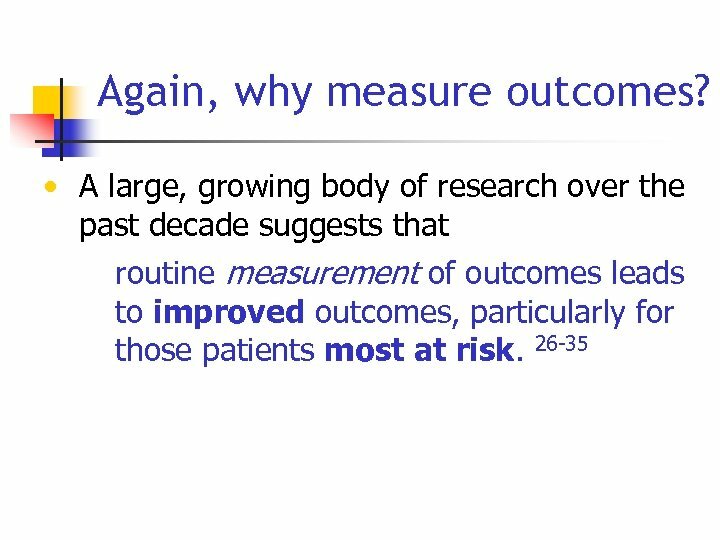 What accounts for the variance in outcomes? Furthermore… • Decades of research support the assertion that different methods of psychotherapy produce similar results. 1 -9 • Likewise, different psychotropic medications may produce similar results. How to choose one? 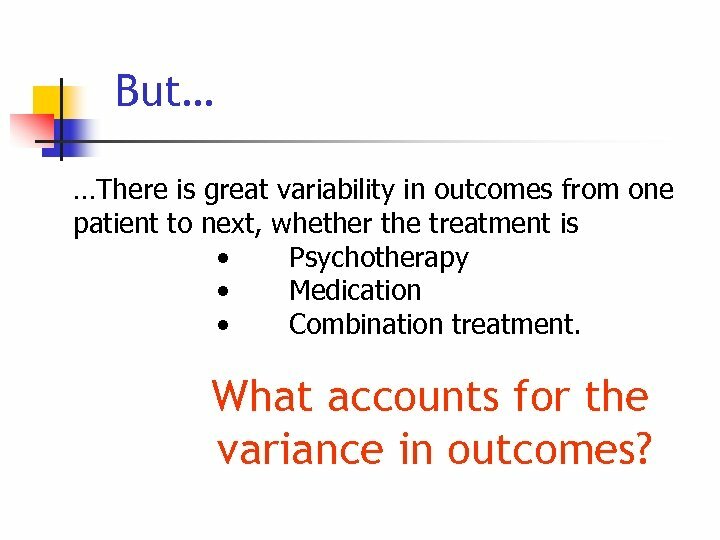 What accounts for the variance in outcomes? 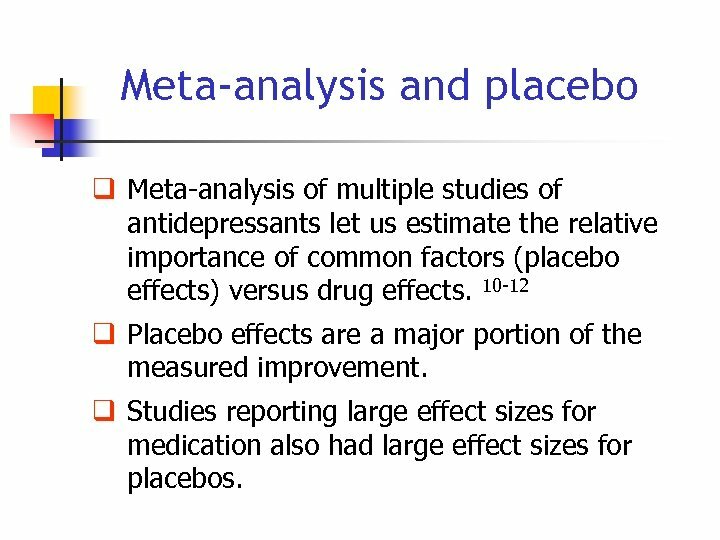 Meta-analysis and placebo q Meta-analysis of multiple studies of antidepressants let us estimate the relative importance of common factors (placebo effects) versus drug effects. 10 -12 q Placebo effects are a major portion of the measured improvement. q Studies reporting large effect sizes for medication also had large effect sizes for placebos. 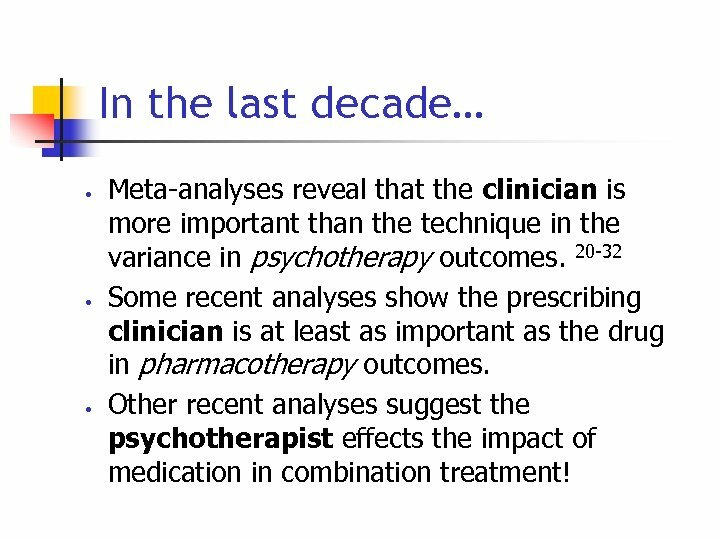 In the last decade… • • • Meta-analyses reveal that the clinician is more important than the technique in the variance in psychotherapy outcomes. 20 -32 Some recent analyses show the prescribing clinician is at least as important as the drug in pharmacotherapy outcomes. 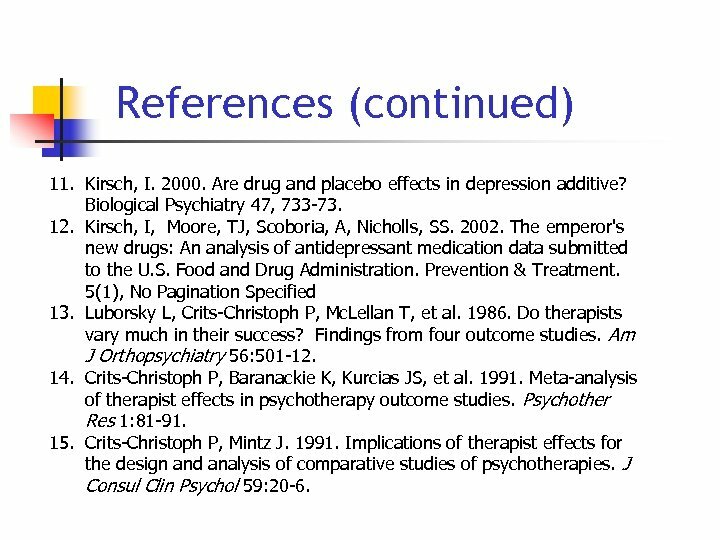 Other recent analyses suggest the psychotherapist effects the impact of medication in combination treatment! 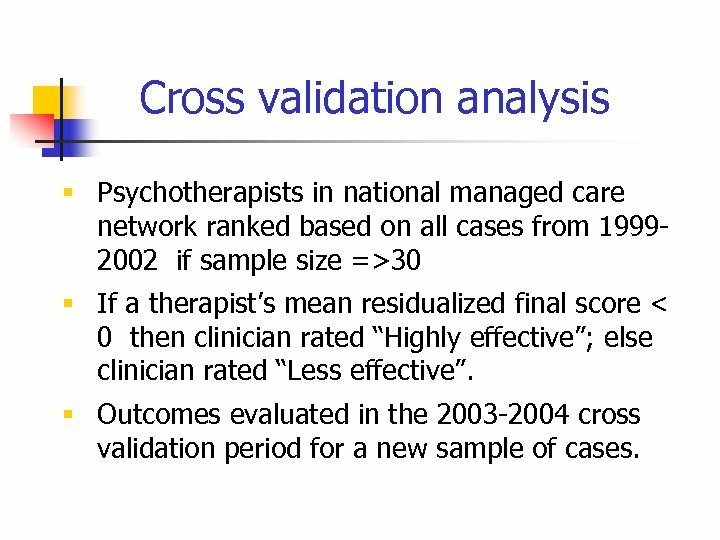 Cross validation analysis § Psychotherapists in national managed care network ranked based on all cases from 19992002 if sample size =>30 § If a therapist’s mean residualized final score < 0 then clinician rated “Highly effective”; else clinician rated “Less effective”. 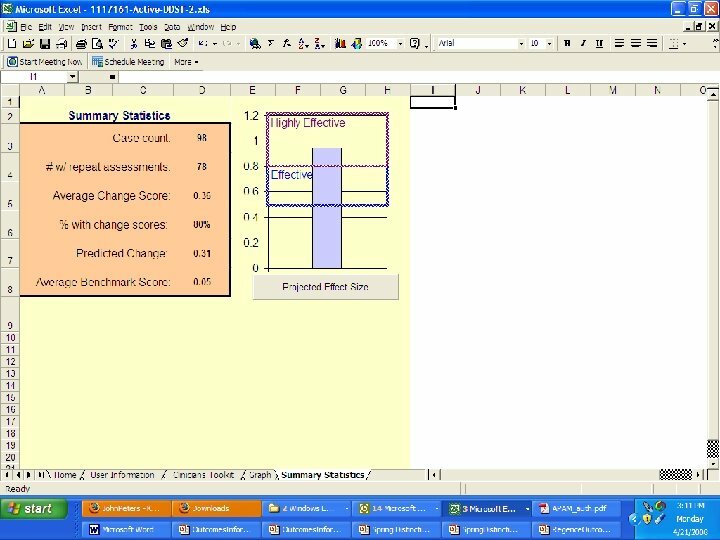 § Outcomes evaluated in the 2003 -2004 cross validation period for a new sample of cases. 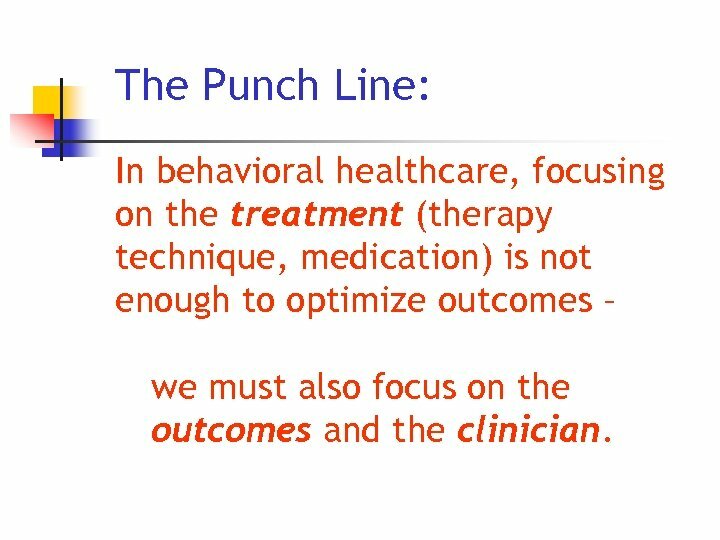 The Punch Line: In behavioral healthcare, focusing on the treatment (therapy technique, medication) is not enough to optimize outcomes – we must also focus on the outcomes and the clinician. 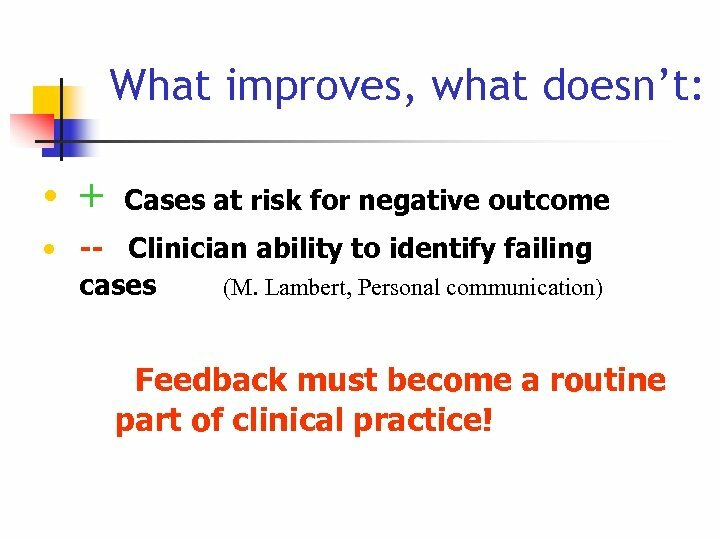 What improves, what doesn’t: • + Cases at risk for negative outcome • -- Clinician ability to identify failing cases (M. Lambert, Personal communication) Feedback must become a routine part of clinical practice! 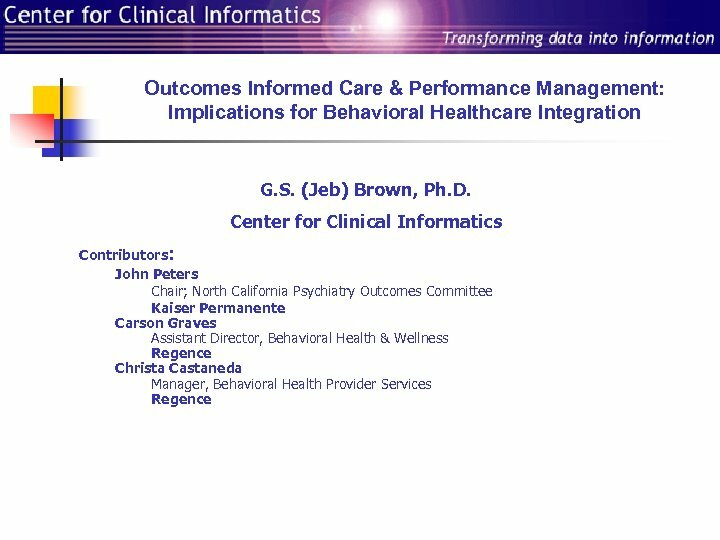 Outcomes informed clinicians… 1. 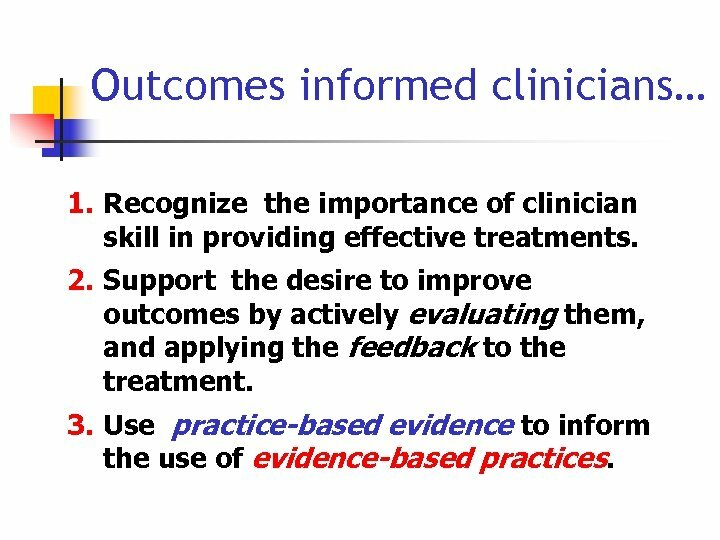 Recognize the importance of clinician skill in providing effective treatments. 2. 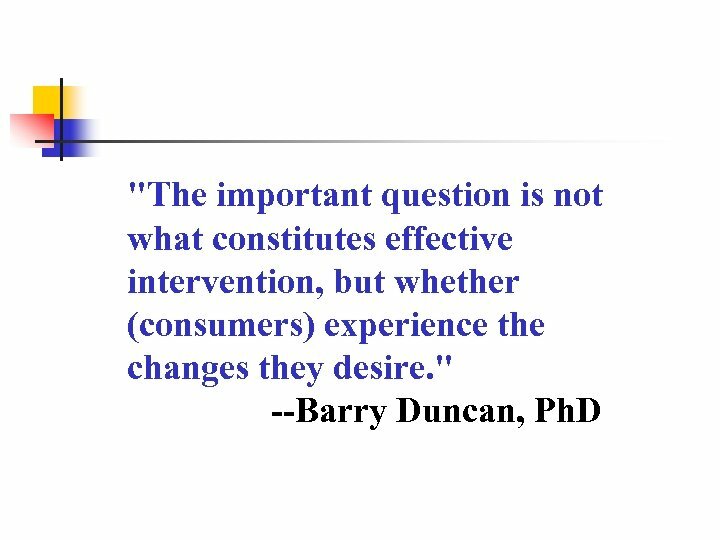 Support the desire to improve outcomes by actively evaluating them, and applying the feedback to the treatment. 3. 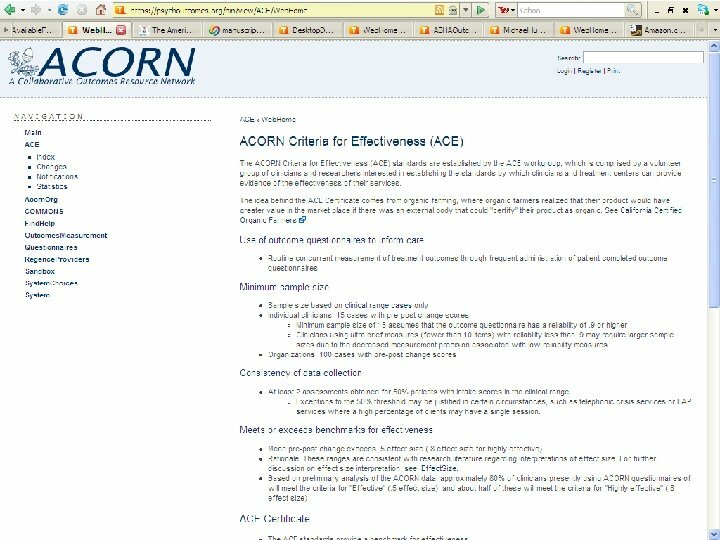 Use practice-based evidence to inform the use of evidence-based practices. 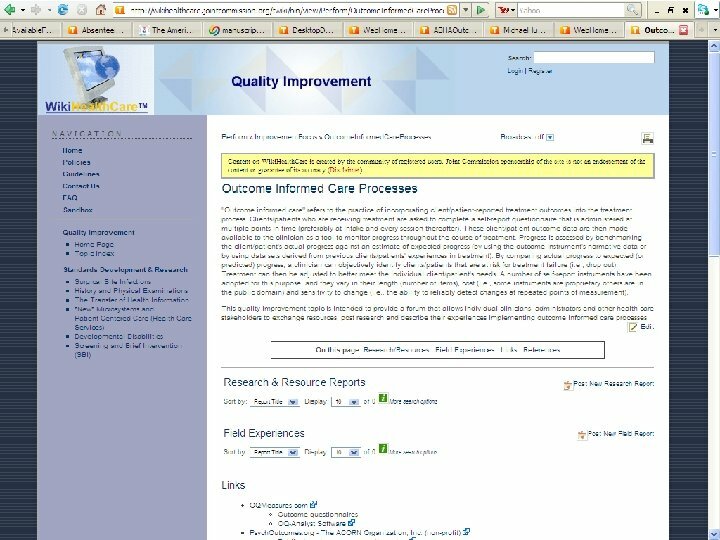 The truth about outcomes questionnaires! 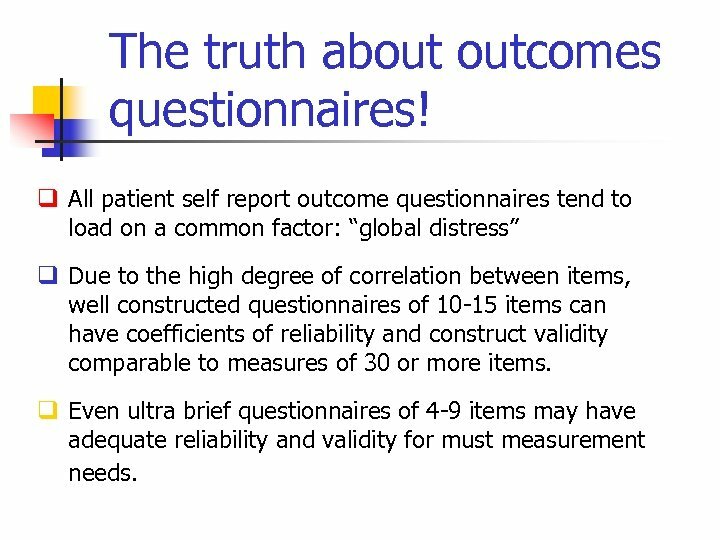 q All patient self report outcome questionnaires tend to load on a common factor: “global distress” q Due to the high degree of correlation between items, well constructed questionnaires of 10 -15 items can have coefficients of reliability and construct validity comparable to measures of 30 or more items. 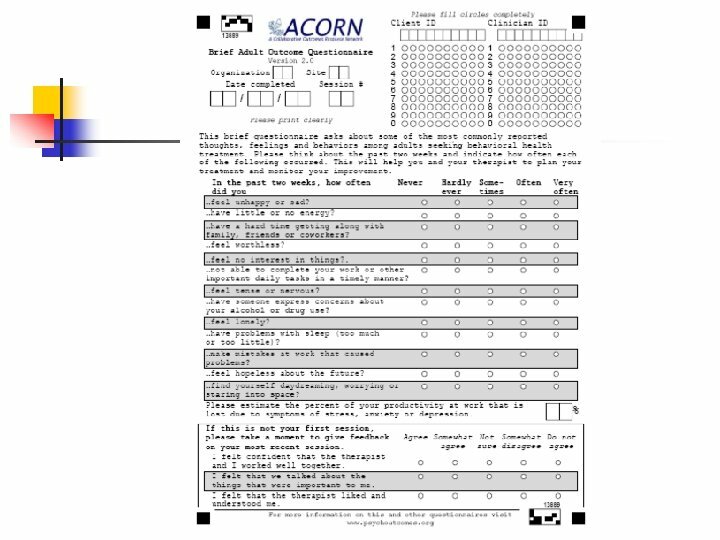 q Even ultra brief questionnaires of 4 -9 items may have adequate reliability and validity for must measurement needs. 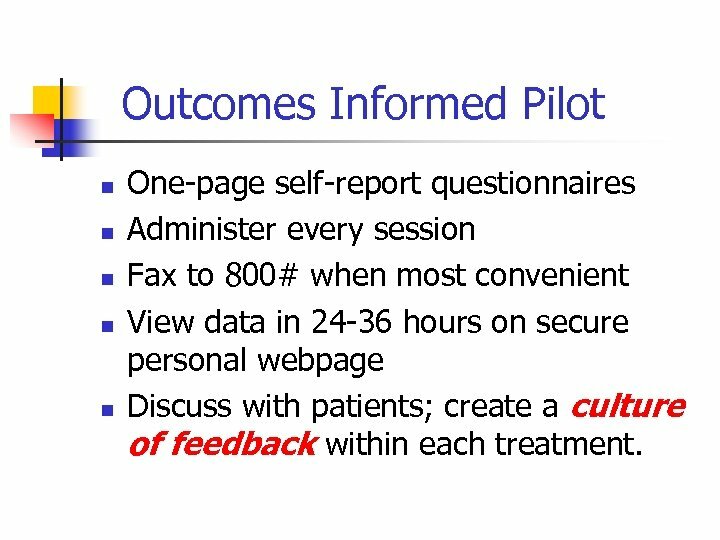 Outcomes Informed Pilot n n n One-page self-report questionnaires Administer every session Fax to 800# when most convenient View data in 24 -36 hours on secure personal webpage Discuss with patients; create a culture of feedback within each treatment. 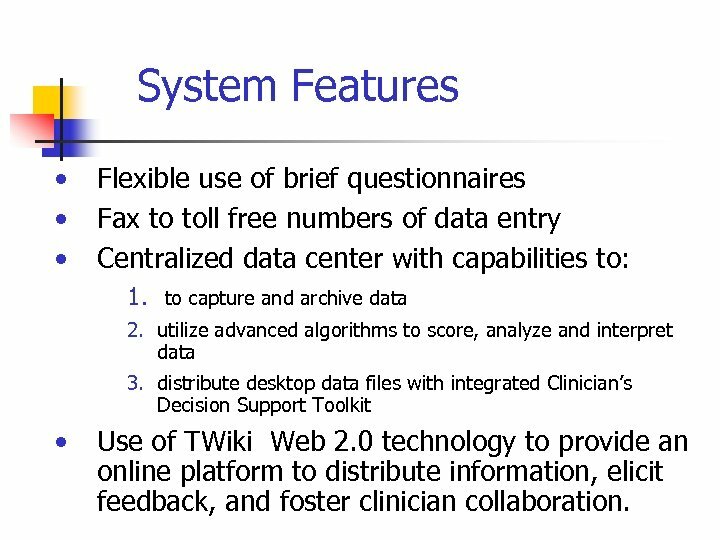 System Features • • • Flexible use of brief questionnaires Fax to toll free numbers of data entry Centralized data center with capabilities to: 1. to capture and archive data 2. utilize advanced algorithms to score, analyze and interpret data 3. distribute desktop data files with integrated Clinician’s Decision Support Toolkit • Use of TWiki Web 2. 0 technology to provide an online platform to distribute information, elicit feedback, and foster clinician collaboration. 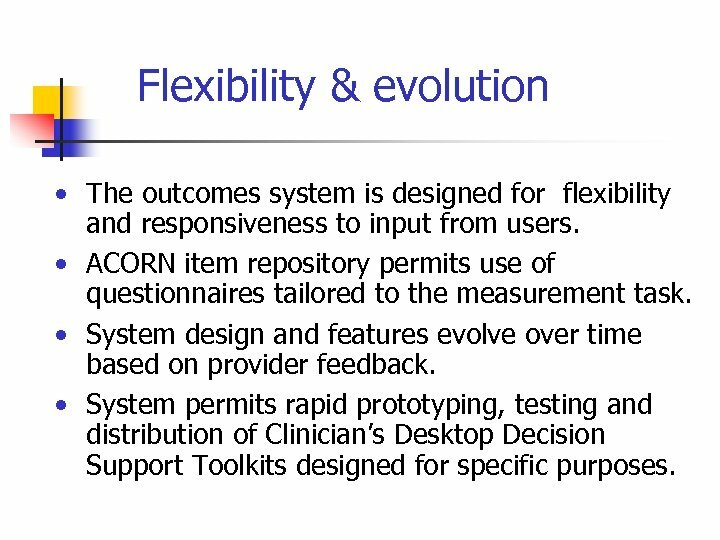 Flexibility & evolution • The outcomes system is designed for flexibility and responsiveness to input from users. 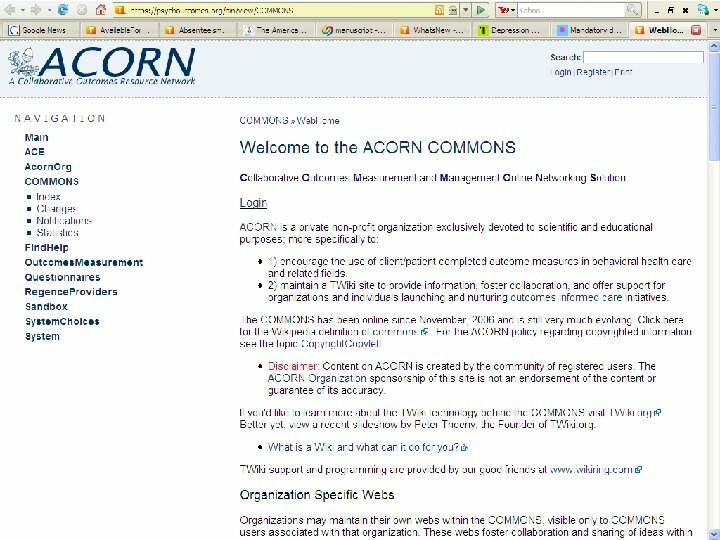 • ACORN item repository permits use of questionnaires tailored to the measurement task. • System design and features evolve over time based on provider feedback. 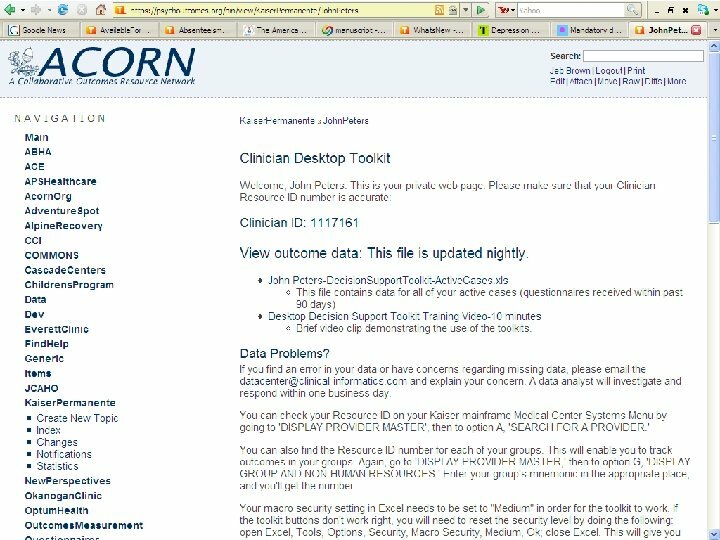 • System permits rapid prototyping, testing and distribution of Clinician’s Desktop Decision Support Toolkits designed for specific purposes. § www. psychoutcomes. 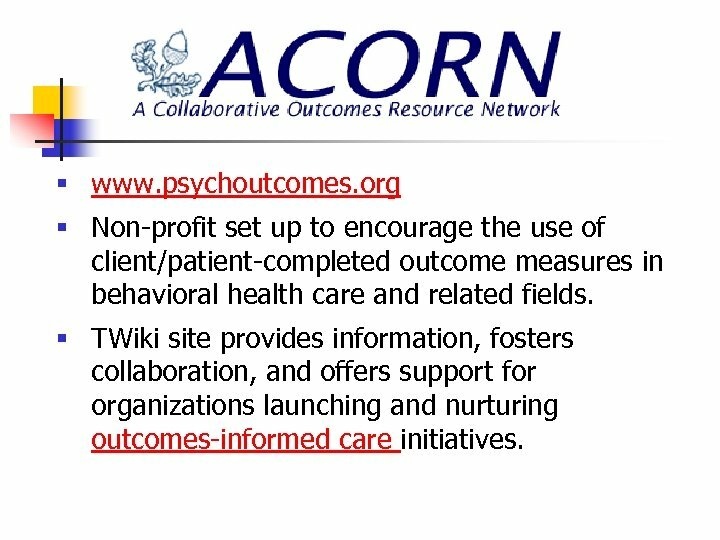 org § Non-profit set up to encourage the use of client/patient-completed outcome measures in behavioral health care and related fields. § TWiki site provides information, fosters collaboration, and offers support for organizations launching and nurturing outcomes-informed care initiatives. Therapeutic alliance q A large body of evidence suggests that the relationship and working alliance between the clinician and patient is an important factor in the outcome. 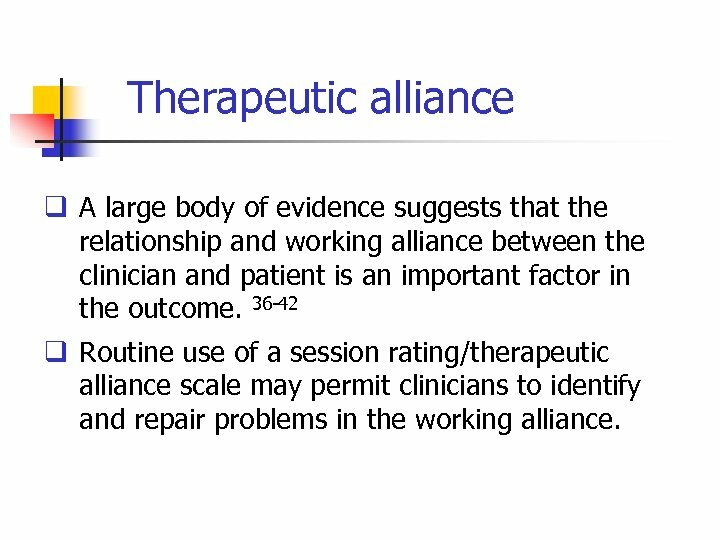 36 -42 q Routine use of a session rating/therapeutic alliance scale may permit clinicians to identify and repair problems in the working alliance. 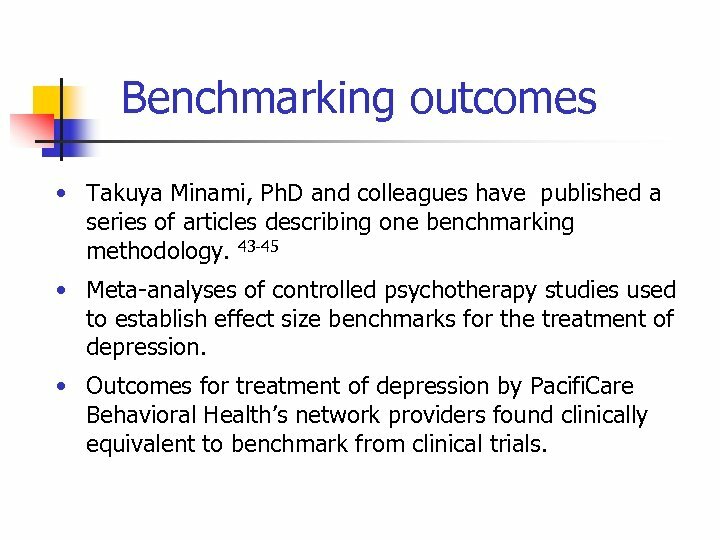 Benchmarking outcomes • Takuya Minami, Ph. D and colleagues have published a series of articles describing one benchmarking methodology. 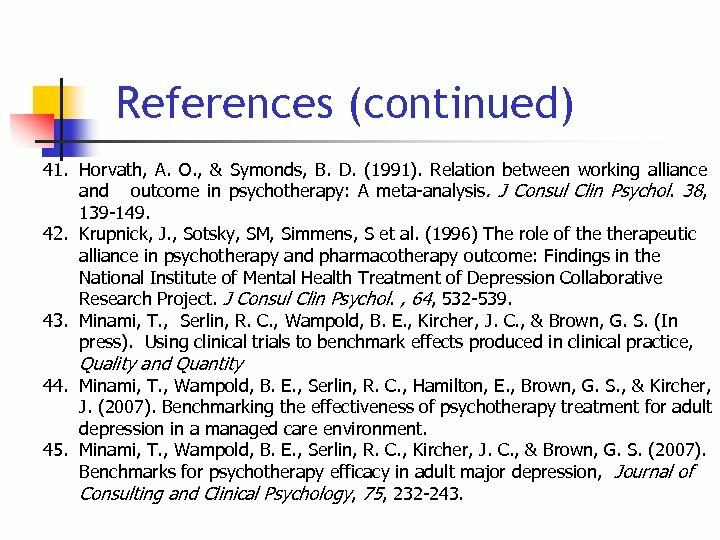 43 -45 • Meta-analyses of controlled psychotherapy studies used to establish effect size benchmarks for the treatment of depression. • Outcomes for treatment of depression by Pacifi. Care Behavioral Health’s network providers found clinically equivalent to benchmark from clinical trials. 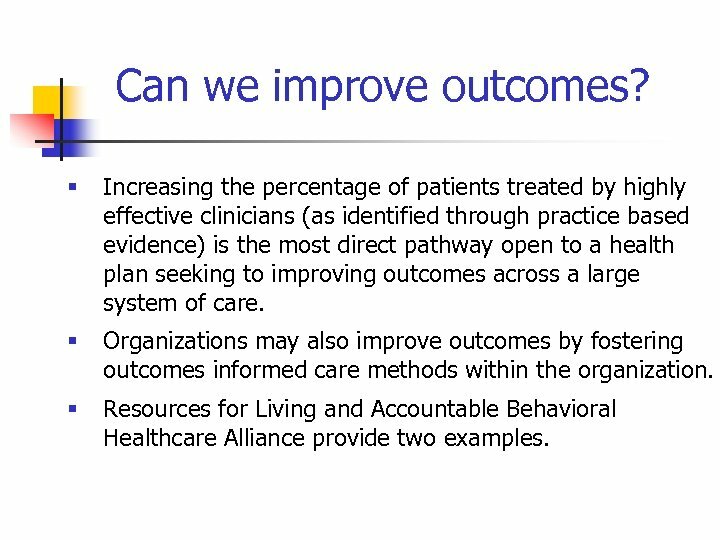 Can we improve outcomes? § Increasing the percentage of patients treated by highly effective clinicians (as identified through practice based evidence) is the most direct pathway open to a health plan seeking to improving outcomes across a large system of care. § Organizations may also improve outcomes by fostering outcomes informed care methods within the organization. 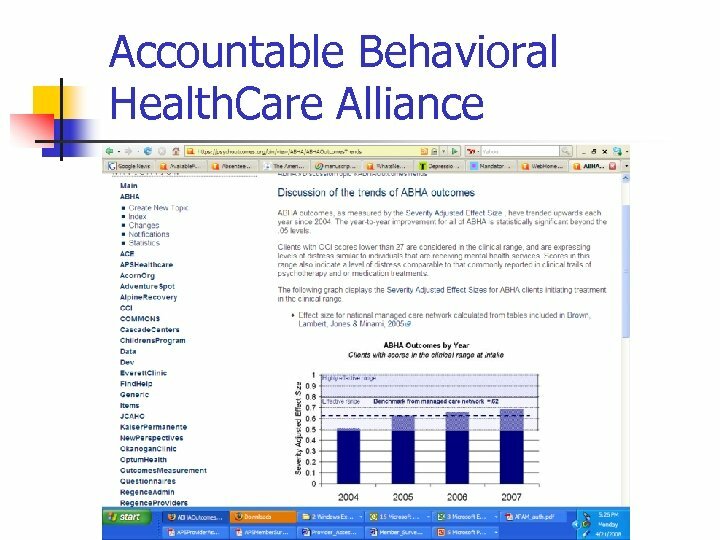 § Resources for Living and Accountable Behavioral Healthcare Alliance provide two examples. 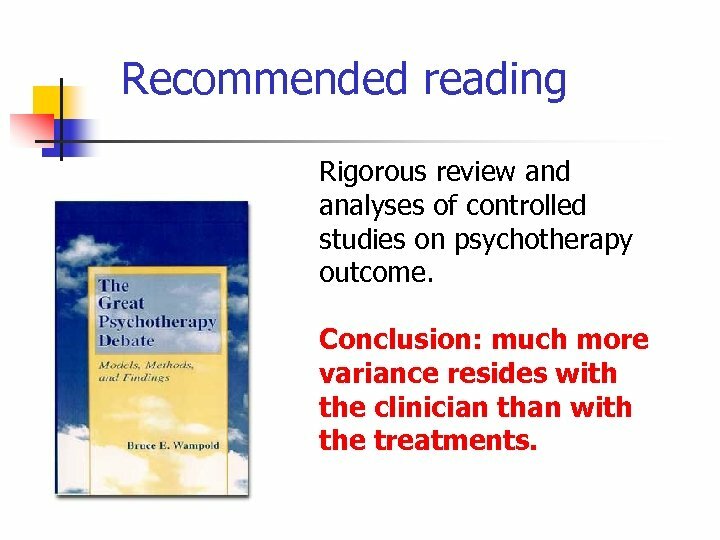 Recommended reading Rigorous review and analyses of controlled studies on psychotherapy outcome. 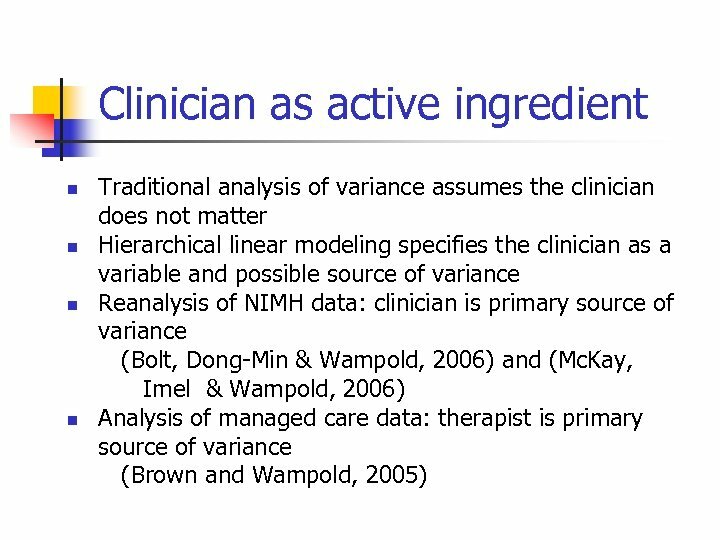 Conclusion: much more variance resides with the clinician than with the treatments. 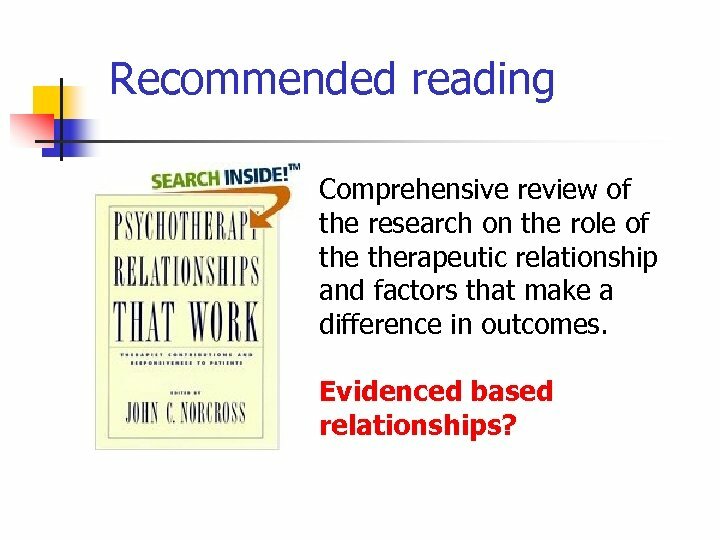 Recommended reading Comprehensive review of the research on the role of therapeutic relationship and factors that make a difference in outcomes. Evidenced based relationships? 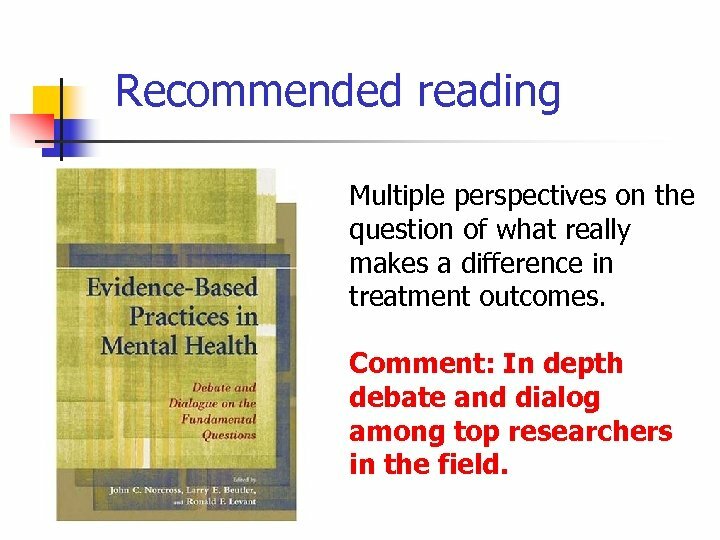 Recommended reading Multiple perspectives on the question of what really makes a difference in treatment outcomes. Comment: In depth debate and dialog among top researchers in the field. References 1. 2. 3. 4. 5. Rosenzweig S. 1936. Some implicit common factors in diverse methods of psychotherapy: “At last the Dodo said, ‘Everybody has won and all must have prizes. ’” Am J Orthopsychiatry 6: 412 -5. Shapiro DA & Shapiro D. 1982. Meta-analysis of comparative therapy outcome studies: A replication and refinement. Psychol Bull 92: 581 -604. Robinson LA, Berman JS, Neimeyer RA. 1990. Psychotherapy for treatment of depression: A comprehensive review of controlled outcome research. Psychol Bull 108: 30 -49. Wampold BE, Mondin GW, Moody M, et al. 1997. 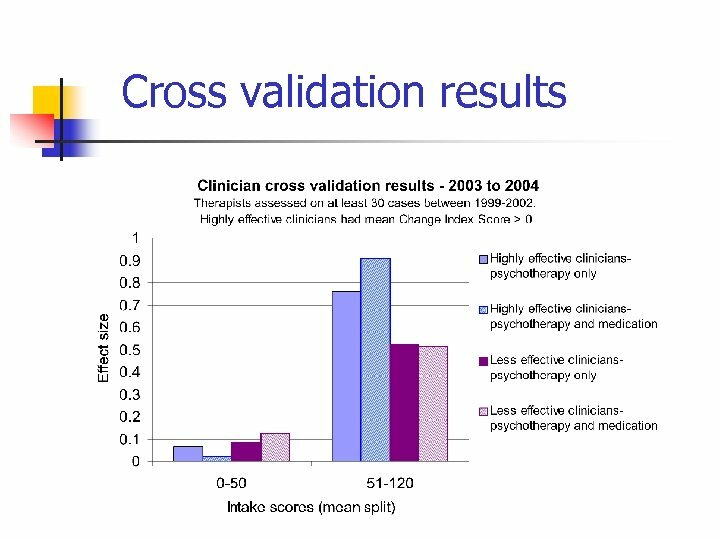 A meta-analysis of outcome studies comparing bona fide psychotherapies: Empirically, “All must have prizes. ” Psychol Bull 122: 203 -15. Ahn H, Wampold BE. 2001. Where oh where are the specific ingredients? 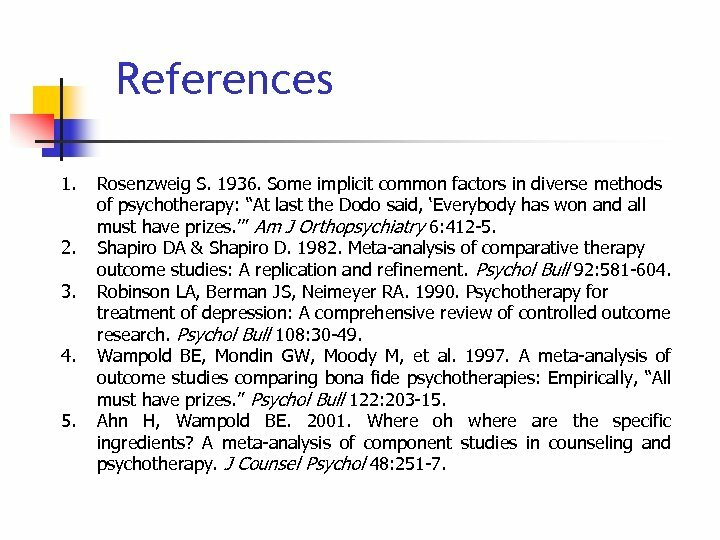 A meta-analysis of component studies in counseling and psychotherapy. J Counsel Psychol 48: 251 -7. References (continued) 11. Kirsch, I. 2000. Are drug and placebo effects in depression additive? Biological Psychiatry 47, 733 -73. 12. Kirsch, I, Moore, TJ, Scoboria, A, Nicholls, SS. 2002. 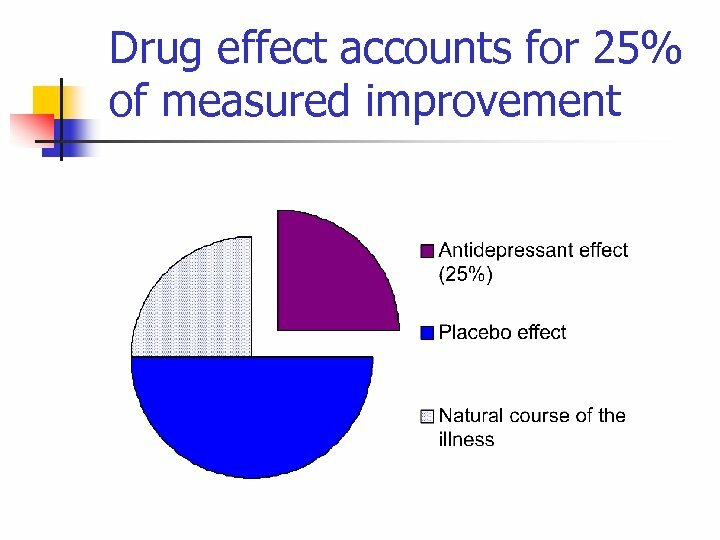 The emperor's new drugs: An analysis of antidepressant medication data submitted to the U. S. Food and Drug Administration. Prevention & Treatment. 5(1), No Pagination Specified 13. Luborsky L, Crits-Christoph P, Mc. Lellan T, et al. 1986. Do therapists vary much in their success? Findings from four outcome studies. Am J Orthopsychiatry 56: 501 -12. 14. Crits-Christoph P, Baranackie K, Kurcias JS, et al. 1991. Meta-analysis of therapist effects in psychotherapy outcome studies. Psychother Res 1: 81 -91. 15. Crits-Christoph P, Mintz J. 1991. 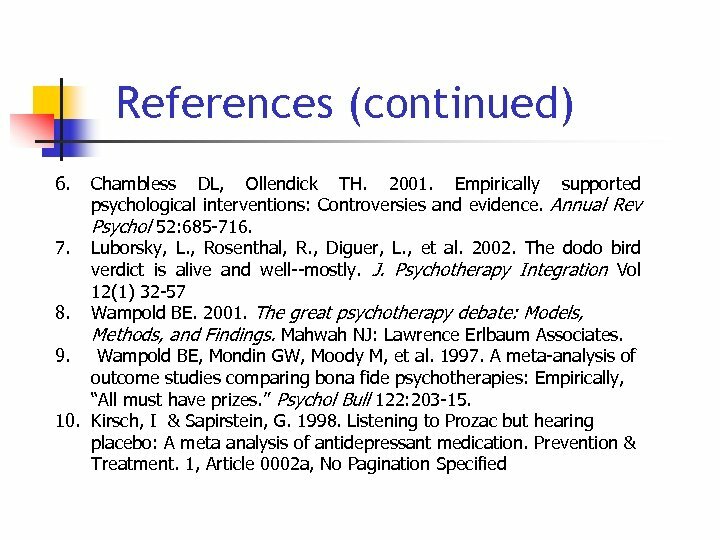 Implications of therapist effects for the design and analysis of comparative studies of psychotherapies. J Consul Clin Psychol 59: 20 -6. References (continued) 16. Wampold BE. 1997. 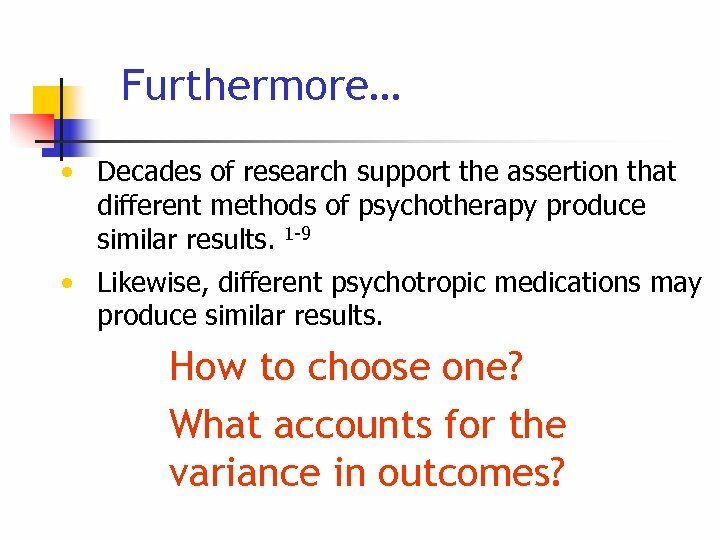 Methodological problems in identifying efficacious psychotherapies. Psychother Res 7: 21 -43, 17. Elkin I. 1999. A major dilemma in psychotherapy outcome research: Disentangling therapists from therapies. Clin Psychol Sci Prac 6: 10 - 32. 18. Wampold BE, Serlin RC. 2000. 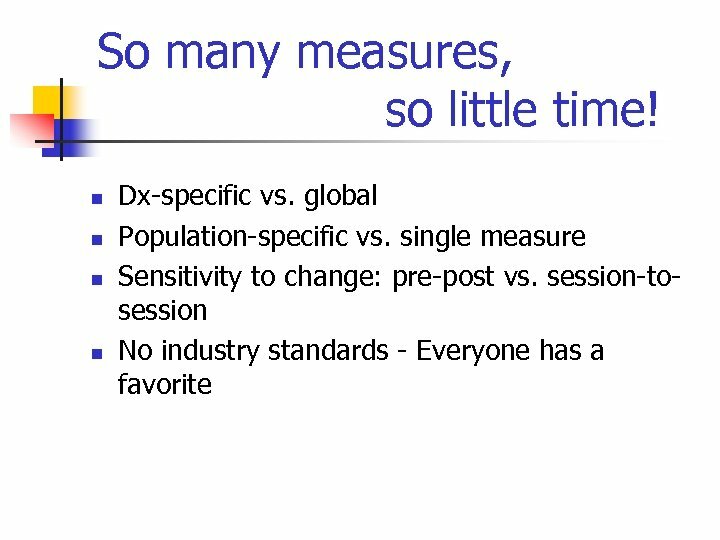 The consequences of ignoring a nested factor on measures of effect size in analysis of variance designs. Psychol Methods 4: 425 -33. 19. Huppert JD, Bufka LF, Barlow DH, et al. 2001. Therapists, therapist variables, and cognitive-behavioral therapy outcomes in a multicenter trial for panic disorder. J Consul Clin Psychol 69: 747 -55. 20. Okiishi J, Lambert MJ, Nielsen SL, et al. 2003. 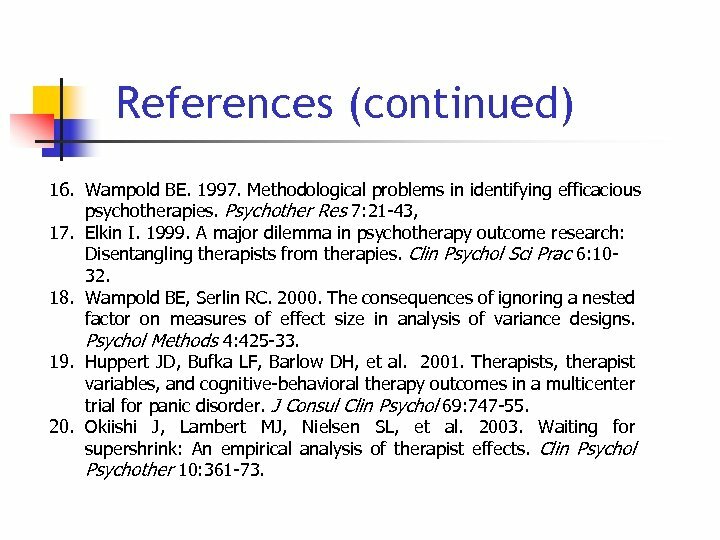 Waiting for supershrink: An empirical analysis of therapist effects. Clin Psychol Psychother 10: 361 -73. References (continued) 21. Brown GS, Jones ER, Lambert MJ, et al. 2005. Identifying highly effective psychotherapists in a managed care environment. 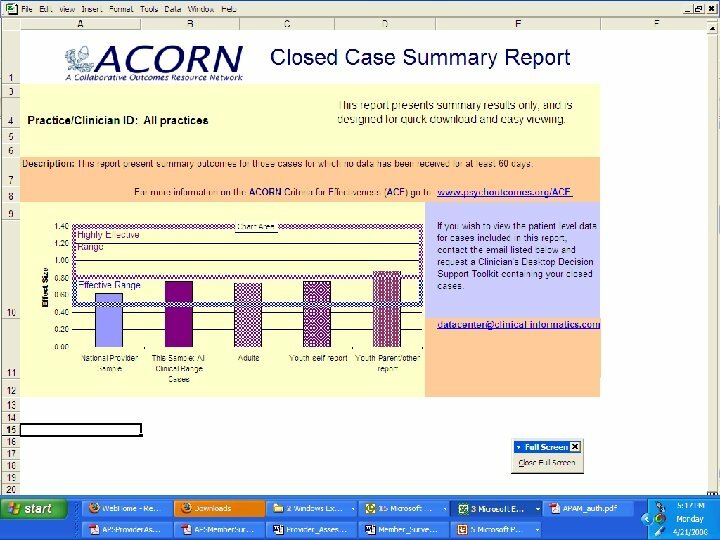 Am J Managed Care 11(8): 513 -20. 22. Wampold BE, Brown GS. 2005. 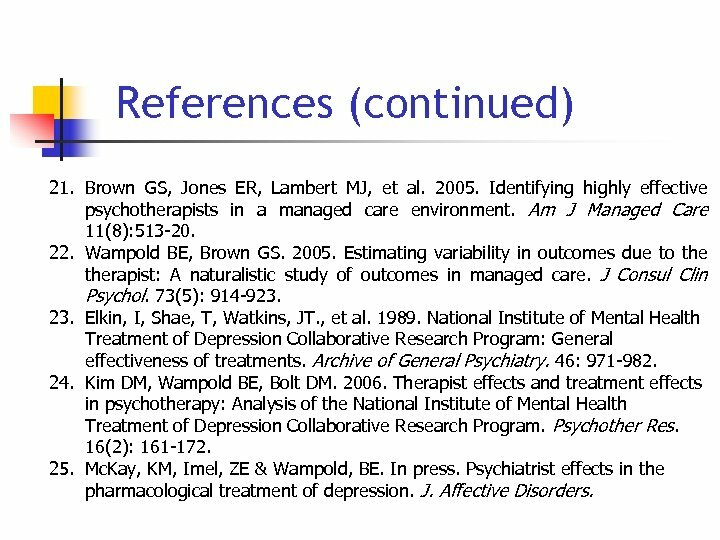 Estimating variability in outcomes due to therapist: A naturalistic study of outcomes in managed care. J Consul Clin Psychol. 73(5): 914 -923. Elkin, I, Shae, T, Watkins, JT. , et al. 1989. National Institute of Mental Health Treatment of Depression Collaborative Research Program: General effectiveness of treatments. Archive of General Psychiatry. 46: 971 -982. 24. Kim DM, Wampold BE, Bolt DM. 2006. Therapist effects and treatment effects in psychotherapy: Analysis of the National Institute of Mental Health Treatment of Depression Collaborative Research Program. Psychother Res. 16(2): 161 -172. 25. Mc. Kay, KM, Imel, ZE & Wampold, BE. In press. Psychiatrist effects in the pharmacological treatment of depression. J. Affective Disorders. References (continued) 26. Hannan C, Lambert MJ, Harmon C et al. 2005. 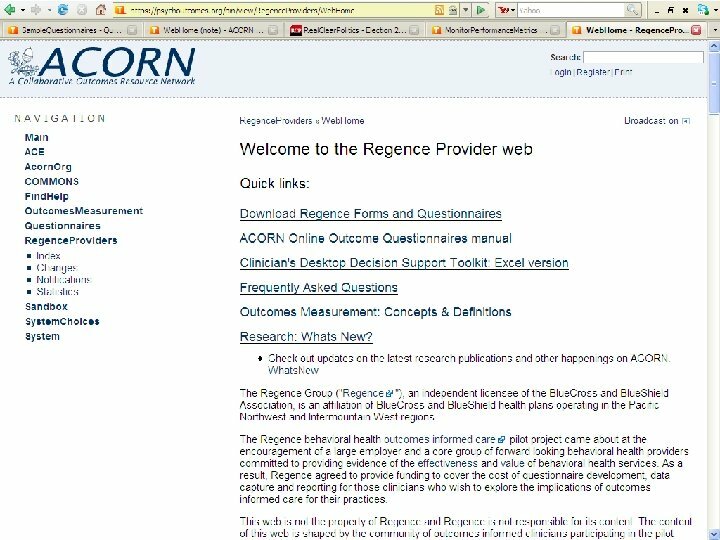 A lab test and algorithms for identifying clients at risk for treatment failure. J Clin Psychol 61(2): 155 -63. 27. Lambert MJ, Harmon C, Slade K et al. 2005. Providing feedback to psychotherapists on their patients progress: Clinical results and practice suggestions J Clin Psychol 61(2): 165 -74. 28. Harmon C, Hawkins, Lambert MJ et al. 2005. 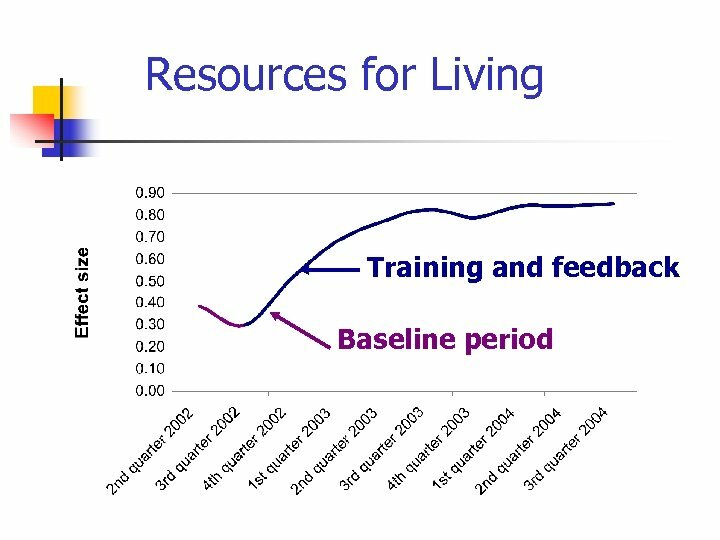 Improving outcomes for poorly responding clients: The use of clinical support tools and feedback to clients. J Clin Psychol 61(2): 175 -85. 29. Brown GS, Jones DR. 2005. 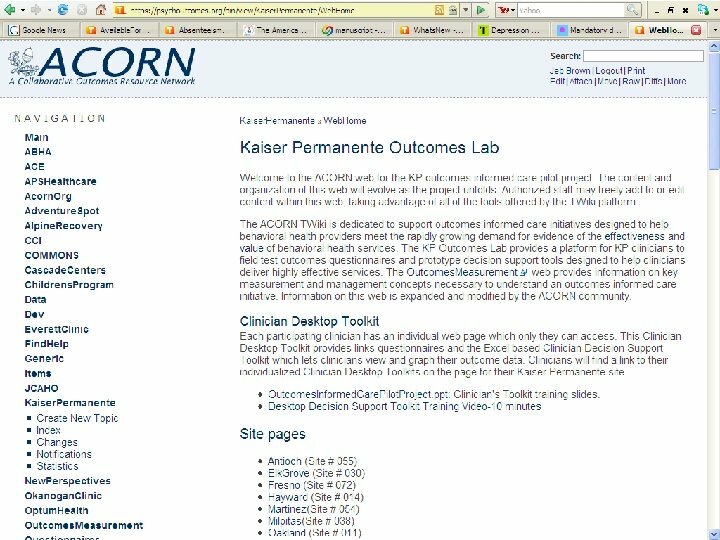 Implementation of a feedback system in a managed care environment: What are patients teaching us? J Clin Psychol 61(2): 187 -98. 30. Claiborn CD, Goodyear EK. 2005. Feedback in psychotherapy. J Clin Psychol 61(2): 209 -21. References (continued) 31. Lueger RJ. 1998. 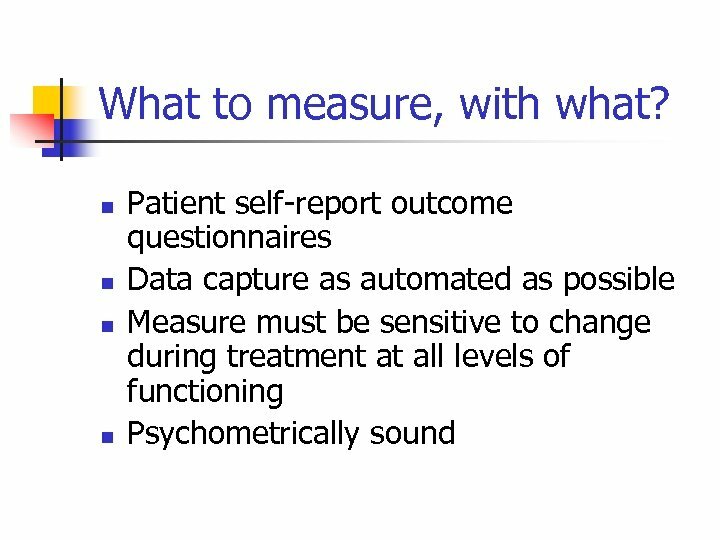 Using feedback on patient progress to predict the outcome of psychotherapy. J Clin Psychol 54: 383 -93. 32. Lambert MJ, Whipple JL, Smart DW, et al. 2001. 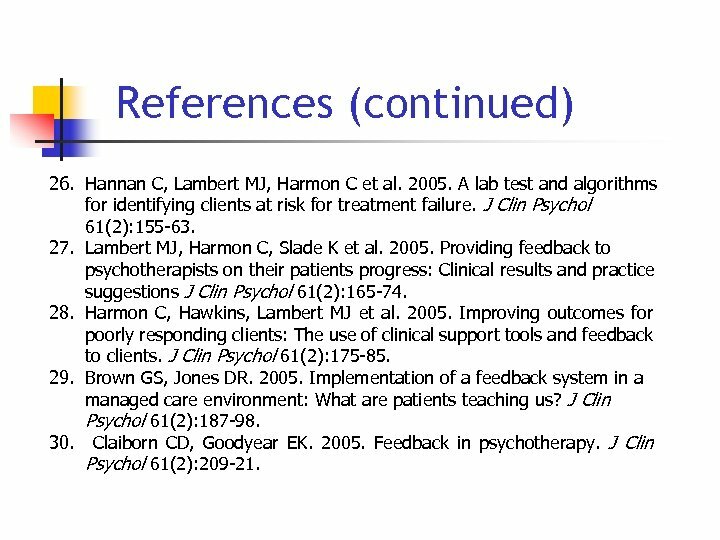 The effects of providing therapists with feedback on patient progress during psychotherapy: Are outcomes enhanced? Psychother Res 11(1): 49 -68. 33. Lambert MJ, Whipple JL, Vermeersch DA, et al. 2002. 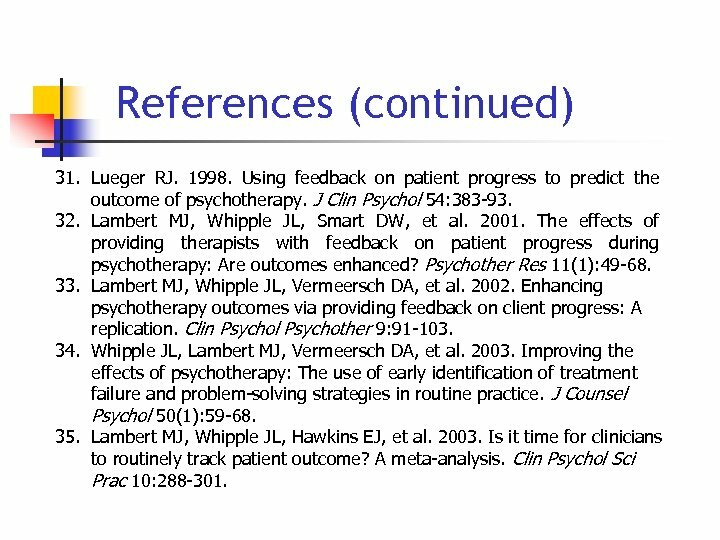 Enhancing psychotherapy outcomes via providing feedback on client progress: A replication. Clin Psychol Psychother 9: 91 -103. 34. Whipple JL, Lambert MJ, Vermeersch DA, et al. 2003. Improving the effects of psychotherapy: The use of early identification of treatment failure and problem-solving strategies in routine practice. J Counsel Psychol 50(1): 59 -68. 35. Lambert MJ, Whipple JL, Hawkins EJ, et al. 2003. 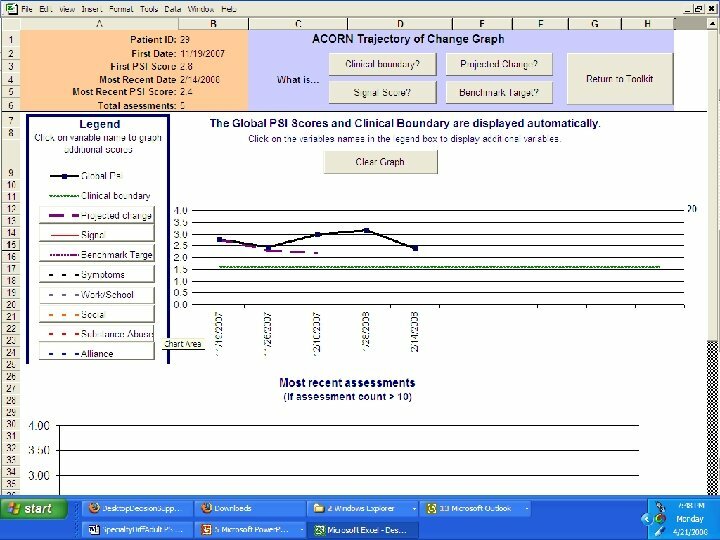 Is it time for clinicians to routinely track patient outcome? A meta-analysis. Clin Psychol Sci Prac 10: 288 -301. References (continued) 36. Bachelor, A. , & Horvath, A. (1999). The therapeutic relationship. In M. A. Hubble, B. L. Duncan, and S. D. Miller (eds. ). The Heart and Soul of Change: What Works in Therapy. Washington, D. C. : APA Press, 133 -178. 37. Blatt, S. J. , Zuroff, D. C. , Quinlan, D. M. , & Pilkonis, P. (1996). Interpersonal factors in brief treatment of depression: Further analyses of the NIMH Treatment of Depression Collaborative Research Program. J Consul Clin Psychol. 64, 162 -171. 38. Bordin, E. S. (1979). The generalizability of the psychoanalytic concept of the working alliance. Psychotherapy: Theory, Research, and Practice, 16, 252 -260. 39. Burns, D. , & Nolen-Hoeksema, S. (1992). Therapeutic empathy and recovery from depression in cognitive-behavioral therapy: A structural equation model. J Consul Clin Psychol. 60, 441 -449. 40. Connors, GJ, Di. Clemente, CC. , Carroll, KM, et al. 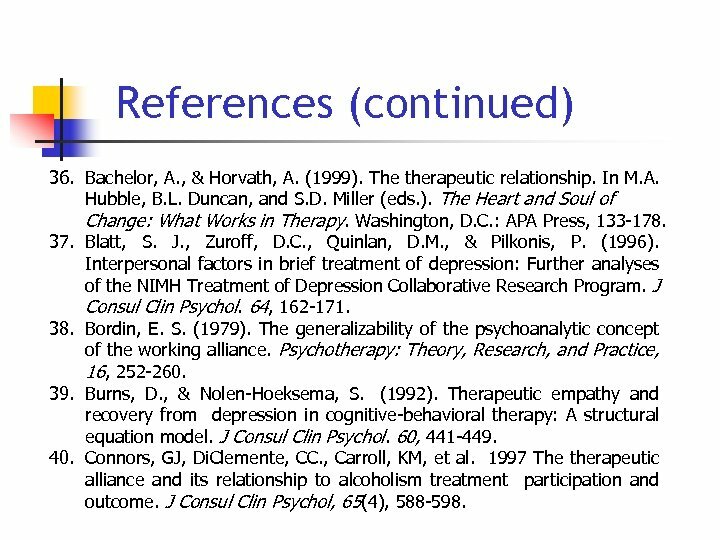 1997 The therapeutic alliance and its relationship to alcoholism treatment participation and outcome. J Consul Clin Psychol, 65(4), 588 -598. References (continued) 41. Horvath, A. O. , & Symonds, B. D. (1991). Relation between working alliance and outcome in psychotherapy: A meta-analysis. J Consul Clin Psychol. 38, 139 -149. 42. Krupnick, J. , Sotsky, SM, Simmens, S et al. (1996) The role of therapeutic alliance in psychotherapy and pharmacotherapy outcome: Findings in the National Institute of Mental Health Treatment of Depression Collaborative Research Project. J Consul Clin Psychol. , 64, 532 -539. 43. Minami, T. , Serlin, R. C. , Wampold, B. E. , Kircher, J. C. , & Brown, G. S. (In press). 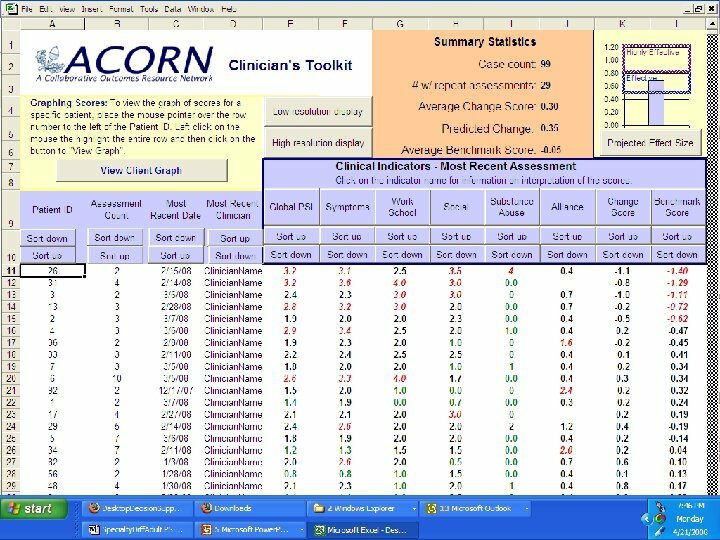 Using clinical trials to benchmark effects produced in clinical practice, Quality and Quantity 44. Minami, T. , Wampold, B. E. , Serlin, R. C. , Hamilton, E. , Brown, G. S. , & Kircher, J. (2007). Benchmarking the effectiveness of psychotherapy treatment for adult depression in a managed care environment. 45. Minami, T. , Wampold, B. E. , Serlin, R. C. , Kircher, J. C. , & Brown, G. S. (2007). Benchmarks for psychotherapy efficacy in adult major depression, Journal of Consulting and Clinical Psychology, 75, 232 -243.